As always it has been a while since my last blog post. I can't believe it is nearing the end of January. Between our trip to Kathmandu and Pokhara, and the craziness of being back to school has been a bit overwhelming. First of all our trip was great. We managed to get on one of the first ever flight to Kathmandu directly form Surkhet. Last year a plane crashed at our airport which resulted in a complete shutdown. Thankfully, just prior to our trip the airport reopened for domestic travel and we managed to snag one of the 18 seats on the plane. It was definitely a tough experience for some of the fellows, who had never been on such a small plane. Fortunately, for my job in the states I flew just about every week, and during one trip flew with my boss in his two seater to South Carolina so it wasn't a huge deal. That said, the flight was amazing (particularly) the flight back where we had some incredible views of the Himalayan. 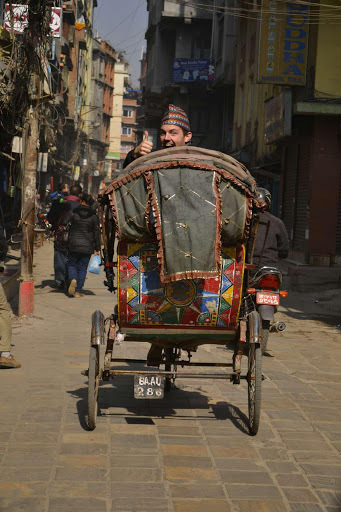 Upon reaching Kathmandu, things went much smoother than the first time around. I've learned a great deal over the past 5 months, and one of the biggest lessons has been how to deal with third world travel. Rather than getting bullied into paying porters and huge rates for taxi's I knew how to handle myself much better this time around. Upon reaching Kathmandu, we stayed at an amazing hotel that is run by a lovely woman from Seattle and her Nepali Husband. They really rolled out the red carpet for us, and one of my favorite things about our entire trip was staying at the Hotel Courtyard in Kathmandu. The hotel was located in the heart of Thamel which is the tourist portion of Kathmandu, which meant we were conveniently located near lots of delicious restaurants. On our first night in the city, Michelle had welcome drinks at the hotel which was followed by a great (and very western) meal at Roadhouse Cafe located down the street. In addition to wonderful people, the hotel had heaters, hot water, and DVD players which was amazing, and just about every night in Kathmandu ended with the heat on and a DVD playing. Beyond the hotel we saw a great deal of sights while in Kathmandu, including the Monkey Temple, Kathmandu Durbar Square, Patan Durbar Square, and the Budha Stupa. 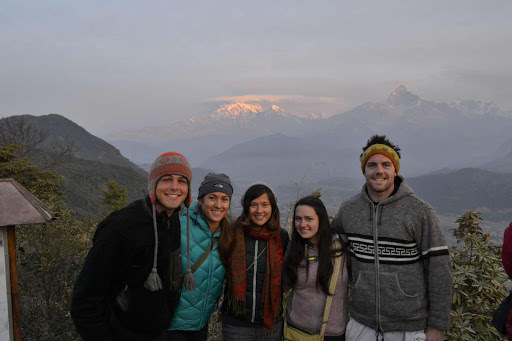 We also met up with the Newest Fellow, Nena prior to heading out to Pokhara and at the last minute convinced her to join us on our adventure. On a more annoying note, Safira and I spent hours dealing with the Indian Visa Service Center in Kathmandu, trying to secure a tourist visa for our trips to India. This ordeal consisted of three visits to the service center, and hours of waiting in a huge holding area. To add insult to injury, we never actually received our Visa's, and were forced to have our travel agent in Kathmandu pick them up for us after we left. 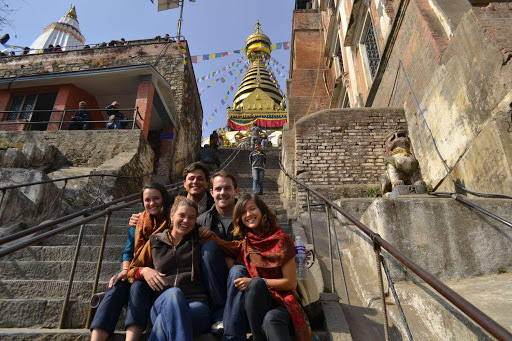 Monkey Temple with the Fellows and Maggie! 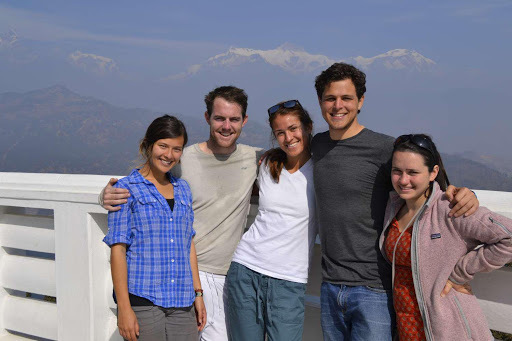 After a few days in Kathmandu we gathered our belongings and made our way to Pokhara. Despite only being 200 miles away the bus ride took 7 hours and really wiped us out for the first night. Additionally the #1 ranked hotel on trip adviser turned out to be an overpriced dud, which was pretty unfortunate. That said, Pokhara is a delightful little town, albeit a bit too touristy for my liking. Having grown up in Fort Lauderdale I've been exposed to a tourist town for much of my life, and I know that it can be a bit of a challenge to decipher between a legitimate restaurant and an overpriced tourist trap. Griping aside, the town was naturally beautiful and our hotel was located in just a block off of Phewa Lake which is Nepal's second largest lake. The weather wasn't extremely cooperative during our stay, however, we could still see the Annapurna mountain range popping out of the clouds with peaks exceeding 25,000 feet. 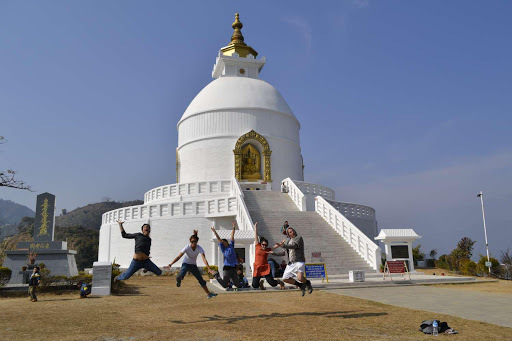 During our stay we visited the World Peace Pagoda, Canoed on Phewa lake, and saw a sunrise at Sangrikot. Beyond the sights, we also paid a visit to a local massage parlor called “seeing hands”. While there we were treated to treatment, by blind employees who have been taught to make a living by giving massages. This was a huge treat for everyone, and especially enjoyable on a cloudy day in Pokhara. As a result of the weather and a need to get back to the Indian Visa office in Kathmandu I had to skip para-gliding which is the one thing I wanted to do and didn't. That said, due to our need to get back to Kathmandu quickly Safira and I took a 20 minute flight back to Kathmandu. This was a huge treat, especially after we found out that Nena, Ben, and Kelly were stuck on the bus for over 9 hours as a result of the weather. At the World Peace Pagoda with our newest addition Nena! Our final couple nights in Kathmandu were wonderful, granted I think we were all excited to get back to Surkhet and see the kids! One highlight from our final night was when Safira, Nena, and I went out on the town with our travel agent. It turns out his cousin is the lead guitarist for the number 1 cover band in the Kathmandu Valley and they were playing at a Hookah bar near the hotel. The band played hits from the last 30 years, which was a treat for our last night in Kathmandu. Since we've been back things have been very busy, while we've been getting back up to speed. I think another highlight of our trip was the return. We got back to school during last period, and were greeted like conquering hero's. The kids came sprinting out of their classrooms to greet all of us, which was extremely special. As the saying goes, distance makes the heart grow fonder, and leaving certainly helped put into perspective how fond I've grown of all the kids here at Kopila Valley. On a somber note, it also showed me how challenging leaving will be. 9 days was hard enough as is, I can't imagine how I feel when I leave for a month with my brother, or when I ultimately decide its time to go back to the states. Overall, I realized how fortunate I am to be here at this moment. I was blessed to get a great job out of college, which enabled me to save enough to live without a paycheck for a year...and blessed to have a wonderful sister who took care of all my DC/USA related issues while I've been gone. (Thanks Mary for getting my apartment successfully moved out and into storage!). Hope all is well at home...Miss you all.